In the wake of Robert Downey Jr.’s abrupt exit from his junket interview with UK Channel 4’s Krishnan Guru-Murthy, many have rushed to defend Iron Man. The majority of the backlash has struck against Guru-Murthy. 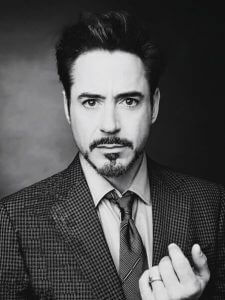 After asking a series of personal questions about Downey Jr.’s troubled past, critics have lambasted the journalist for his ‘cringeworthy’ and ‘awkward’ tactics, whilst several others commented the invasiveness of the questions and his lack of professionalism. Consequently, the fluffed interview has generated worldwide headlines. In fact, the drama has overshadowed the hugely positive story about how Robert Downey Jr. presented a bionic arm to a nine-year-old boy whilst in the guise of Iron Man. However, it is indubitable that the video of the segment, unusually posted by Guru-Murthy on his Twitter, would not have gone viral and spiralled across the Internet had the promo-interview gone to plan. Celebrity press junkets are not known for being fun or even particularly exciting. As an experience, they are decidedly strange, surreal even; a celebrity sits in a room, a journalist enters the room, they ask questions for eight minutes, they leave, another journalist enters, they ask mostly the same questions for another eight minutes, they leave, the next journalist enters, and so on. It’s a contractually obligated Groundhog Day. The junket is, therefore, a purely publicity-oriented interview, which perhaps explains Downey Jr.’s puzzlement when he asked, “Are we promoting a movie?” in response to the increasingly personal angle of Guru-Murthy’s questions. Yet journalists often ask the more difficult questions. They are in fact entitled to ask them – it’s their job after all – and those questions could theoretically be about anything. Even in a junket scenario. This means that there is always a chance, even in interviews where the topics are pre-decided, that questions may go ‘off-topic’. It happens all of the time. Especially when the only real way to make a sit-down like this interesting is to encourage it to go horribly wrong (consider the public apology hastily issued by fellow Avengers, Chris Evans and Jeremy Renner after being accused of sexism towards the only female member of their team Black Widow). Therefore, whilst Downey Jr. was there for the sole purpose of discussing Avengers: Age of Ultron, Guru-Murthy’s purpose was to ask newsworthy questions. He should have been ready for it. And there were several ways that could have stopped these eight minutes from turning a banal Q&A into international news. The first is simply that Downey Jr. did not have to walk out. There were two occasions where Guru-Murthy stumbled over himself to give the actor a chance to say he did not want to talk about drugs, alcohol and daddy-issues. Had he done so, had he simply brushed the questions off or admitted he did not wish to discuss those issues, the segment would have been a lot duller and less newsworthy than walking out ultimately made it. The second is that, though Guru-Murthy’s questions were pointedly personal, they could have had a direct bearing on his character in the film. The infamous Tony Stark whose similarities to Downey Jr. were one of the enduring themes of early Iron Man interviews (one of the most famous comic story lines was Stark’s battle with alcoholism). With a little bit of preparation, the questions could have easily been swung back into a discussion of the film. This move would have left the past in the past. Thirdly, then, a tried and tested method for avoiding serious questions a ‘news reporter’ like Krishnan Guru-Murthy might try to raise is to become a ‘charming waffler’, to gabble on so that the journalist thinks they have television gold right up until they listen back and realise precisely nothing has been said that hasn’t been said before. This takes a level of engagement with the questions being asked that can, after the eighth or ninth round of interviews, become tedious. But it works precisely because it keeps control with the celebrity, rather than their interviewer. Lastly, however, the fact that Downey Jr. felt it necessary to walk out suggests that his ‘four bristling PRs’ failed to adequately prepare him for such a divergence from the usual promo press. He could have employed any of the three tactics above. But he did not. This is particularly poignant given that Guru-Murthy’s article in the Guardian explained that he had cleared the general gist of his interview beforehand, and was surprised when the interview became uncomfortable. A celebrity’s publicist should always prepare their client. Media training for such events could have avoided or mitigated the impact of his exit. There is no doubt that Guru-Murthy’s line of questioning overstepped the contractual obligations presiding over this kind of media interview. He may quote previous interviews with the New York Times and Vanity Fair in order to justify his enquiry, but a press junket is not an expose. Perhaps we should not expect a celebrity, even one as seasoned as the Iron Man, to be unsurprised by such a personal line of enquiry. Thus, whilst his walkout is understandable, a little more engagement with the first set of questions and preparation for the unexpected would have kept Robert Downey Jr.’s interview firmly inside publicity lines.